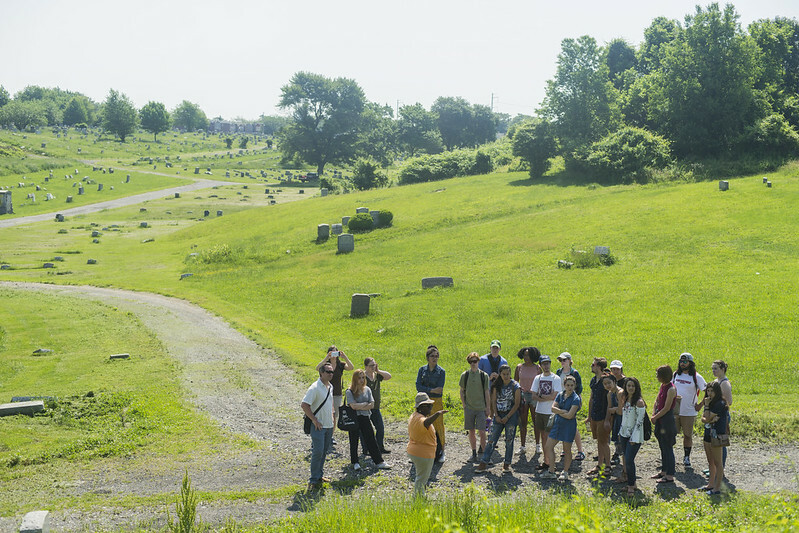 The students in the 2018 Ethical Leadership Institute's Philadelphia track visited Mount Moriah Cemetery. Photo by Patrick Montero. There is something uniquely Haverfordian about the Ethical Leadership Summer Institute (ELSI), from the interdisciplinary nature of the program to the way it fuels boundless exploration, close bonds with peers, and meaningful interactions with alumni. When ELSI first launched in 2016, as a part of the President’s Office’s Initiative for Ethical Engagement and Leadership, it was organized and led by Visiting Professor of Economics and Independent College Programs Neal Grabell '77. This year, the Center for Peace and Global Citizenship took the helm and expanded upon the learning goals and opportunities available to participants. Following last year’s expansion—which added a health-ethics track to the already-existing business-ethics one—the 2018 Ethical Leadership Summer Institute changed its format slightly to focus on applied ethical action. One track was devoted to global health and a new track was designed for students embarking on summer internships or yearlong fellowships in Philadelphia, which aimed to introduce them to a new side of the city and its burgeoning nonprofit sector. ELSI welcomed 11 Philadelphia-based CPGC-sponsored interns and six incoming Class of 2018 Haverford House Fellows for a weeklong exploration into all that Philadelphia has to offer. No two days of the Institute looked the same, with students travelling to neighborhoods throughout the city, eager to explore the narratives of activism and resistance that permeate one of the oldest cities in the nation. According to Eric Hartman, executive director of the CPGC, the Institute’s goal this year was to equip participants with useful skills for their coming internships and fellowships. Students in ELSI's Philadelphia track debriefed at Cobbs Creek Community Environmental Education Center. For the CPGC-sponsored interns and Haverford House Fellows who took part in the Ethical Leadership Summer Institute, the experience was invaluable. "I’ve enjoyed seeing so many pockets of light and small actions that don’t necessarily dismantle huge structures of power, but that do make space for people and communities in small, important ways,” said Cole Sansom ‘19. Hasibe Caballero-Gomez ‘21 was struck by the level of engagement with the city available to her through the Ethical Leadership Summer Institute. Though the Ethical Leadership Summer Institute has wrapped up and the participants are off to explore their individual internships in a wide variety of fields—the CPGC is sponsoring the work of 64 Bi-College summer interns around the world, 14 of whom will be Philly-based— the lessons learned and skills acquired through ELSI live on in these students. By focusing on the ethical dimensions of their work, they are attuned to the unintended consequences and tradeoffs of their decisions and actions.